As 2019 ushers in a new era for the flagship smartphone world, dynamics in the industry will change. Innovation’s increasingly hard (and expensive to come by), with key features of a gadget often requiring years of research and investment before a manufacturer can upgrade them meaningfully. Therefore, companies such as Samsung who’ve got high capital investments in technologies critical to a mobile gadget will thrive and have a unique edge over the competitors. This fact is evident in the recently launched Galaxy S10 lineup. Samsung’s Galaxy S10 and S10 Plus come with fantastic displays, showing that the Korean tech giant means business when it claims to have the best smartphone displays in the world. Now, the good folks over at DisplayMate also back up Samsung’s claim. Take a look below for more details. Samsung’s display for the Galaxy S10 is unlike that present on any other smartphone right now. The display has a 3K high resolution of 3040×1440 diamond pixels. Samsung introduced Diamond Pixels back on the Galaxy S4, and even Apple’s iPhone X has this unique pixel composition. The Diamond Pixel pattern accommodates for light emission efficiency through pixel size. A Green pixel is of the smallest size on these displays as it is the most efficient, with Blue being the largest. Another cool feature that’s present on the Galaxy S10’s display is the capability to automatically switch between color gamuts. Color gamuts, for the uninitiated, are the spectrums of the three primary colors (Red, Green and Blue) that are emitted by a display. Right now, the current ‘in’ spectrum is DCI-P3. However, while the DCI-P3 covers 26% more area on the CIE Chromaticity diagram, this is rendered useless if the content that you’re watching doesn’t support the gamut. Samsung’s Galaxy S10 also comes with the ability to judge which display gamut is the correct one and make this switch before the user realizes the need to make it himself. Finally, the Galaxy S9 also comes with the exact same Wide Color Gamut, going to show how Samsung’s holding itself back due to lack of content. While we’re on the topic, it’s also relevant to note that the S10’s display supports both the DCI-P3 and sRGB/Rec 709 color gamuts. The Galaxy S10 also comes with a larger native color gamut that covers a larger spectrum that both DCI-P3 and Rec 709. However, this is pretty much useless unless content that supports this range also starts to become available. Both sRGB and DCI-P3 are also reduced as brightness increases – which is expected. However, when compared to the Galaxy S9, the reduction, reduces. Moving towards color accuracy, the Galaxy S10 improves over its predecessor in this department. 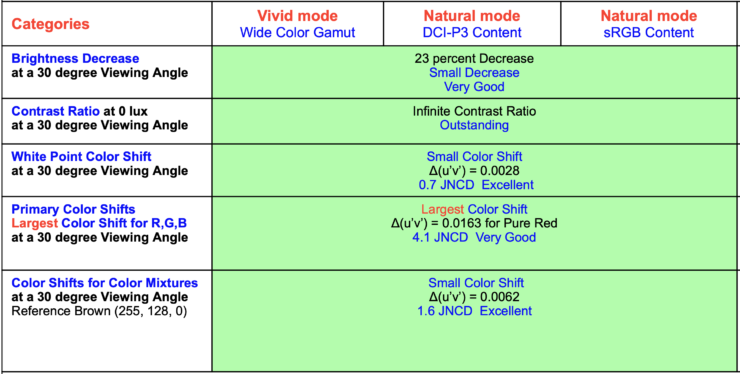 The Galaxy S9 has 0.7 JNCD (Just Noticeable Color Difference) for the sRGB and DCI-P3 Gamuts, and a staggering 9.1 JNCD for the Wide Color Gamut. In comparison, the Galaxy S10 has 0.4 and 0.5 JNCD for DCI-P3 and sRGB respectively and 7.7 JNCD for Wide Color. These are important upgrades, and for DCI-PR + sRGB will prove to be sufficient enough even if Samsung decides to leave them unchanged on the next generation of its displays. One important aspect where the Galaxy S10’s display improves vastly over its predecessor is the Gamma rating for Intensity. A display’s intensity is a measure of how the primary colors combine to produce secondary colors, and how much contrast is present in an image. 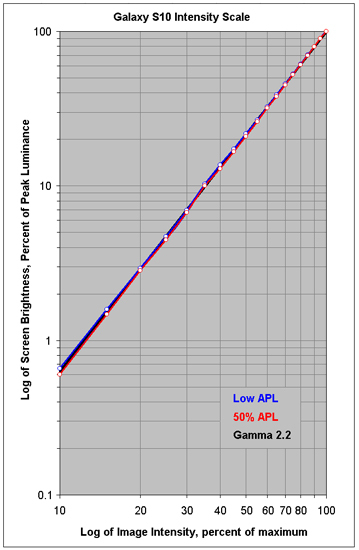 Cutting the long story short, in order to be perfect in this regard a display has to achieve a 2.20 Gamma rating. The Gamma rating is the log of the intensity scale and while the Galaxy S9 achieved only 2.29 Gamma, the Galaxy S10 is a perfect 2.2. Samsung’s Galaxy S10 reflects 4.4% of light on average, and this figure increases to 5.6% for mirror reflections. These figures remain virtually unchanged from the Galaxy S9. However, what does change is the number of colors that you will be able to perceive while viewing the Galaxy S10 in high ambient light. Moving towards luminance, the Galaxy S10 has a brighter display than its predecessor. The smartphone is brighter with all variants of white light and improves significantly over the Galaxy S9. For example, while Samsung’s 2018 flagship had a luminance of 363 cd/m2 (candela per meter squared) for full brightness with 100% Average Picture Level (maximum White), the S10 has a luminance of 403cd/m2. Keep in mind that both these readings are for the DCI-P3 color gamut. Moving to another important metric, the Galaxy S10 also improves on the ability to differentiate between colors in high ambient light. The Galaxy S10 has a contrast rating that lies between 90 – 92 for sRGB and DCI-P3 for manual brightness. Samsung’s made important changes throughout various metrics of the Galaxy S10’s display, as the company looks to maintain its display dominance this year as well. Finally, moving towards viewing angles, we see mixed improvements. 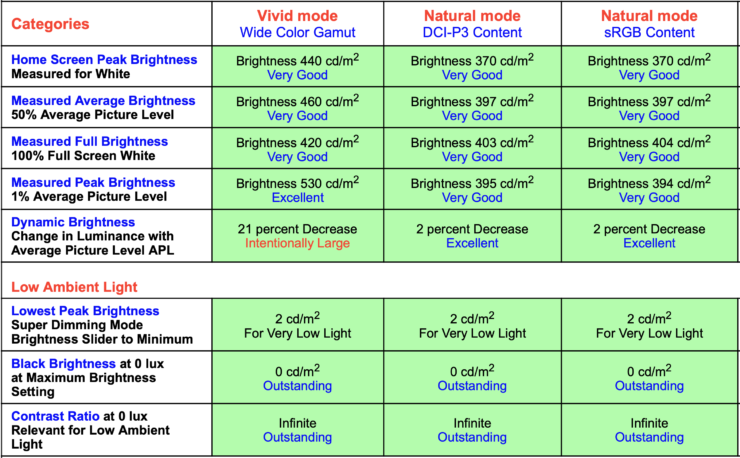 While the Galaxy S10 reduces the brightness decrease at a 30˚ viewing angle, color shifts for primary colors and color mixtures increase to 4.1 JNCD and 1.6 JNCD from 3.3 JNCD and 1.3 JNCD respectively. All in all, the Galaxy S10’s display is one of the best in the market, and if you’ve been reading closely, you’ll know why. OLEDs are expected to be with us for at least a year or two, and as time passes, improved content for larger color outputs will ensure that user viewing experience is starkly different from the days of NTSC. Thoughts? Let us know what you think in the comments section below and stay tuned. We’ll keep you updated on the latest.